The HC100™ makes it exceptionally easy to print individual wristbands on demand. Drop in the wristband cartridge and start printing high-quality wristbands for positive patient identification or hospitaility applications. The HC100 is engineered to be easily wiped down with hospital disinfectants. Zebra offers a complete range of wristband styles, sizes and colours for healthcare, amusement, water-park and entertainment applications. A Total Solution for Wristband Printing Zebra's HC100 wristband printer was developed to maximize ease of use. Just pop the easy-to-load cartridges containing Zebra's Z-Band wristbands into the printer—and print individual wristbands. The wide range of available wristbands are suitable for hospital patient identification as well as guest identification at hospitality venues and attractions such as amusement parks, sporting events and zoos.It’s easy-to-load feature requires minimal user action as the printer detects the wristband type and size and automatically calibrates the settings for optimal print quality and reduced waste. There is minimal training required to use the HC100—loading or switching the cartridge is a quick and simple task. The wristband cartridges are available in a wide variety of wristband sizes and colors and feature a waterproof adhesive, making the HC100 an ideal solution for amusement and water park guest identification. With faster print speeds, wait lines at the point of entrance are reduced, improving the customer experience and staff productivity. The HC100 withstands most hospital disinfectants and with more connectivity options—including 802.11b/g wireless LAN capability—and a small footprint, the HC100 printer works with your network and fits your workspace. The HC100 allows you to print patient information and all industry standard one- and two-dimensional barcode symbologies directly onto Zebra's Z-Band direct thermal wristbands—featured with an antimicrobial coating and available with adhesive or clip closure, in a variety of sizes, colors and materials—enabling hospital staff to process patient admissions quickly and safely. Healthcare Wristbands Zebra’s Z-Band thermal wristbands allow you to print patient information and barcodes directly on the wristbands. Secure, fast and easy identification of people is an increasingly important market. This applies to hospitals patient management as well as to event management and leisure park owners entrance cards and tickets and educational establishments. Even in other fields that require reliable personal identification, like RD departments, laboratories, conferences or concerts, wristbands have become imperative. They guarantee fraud-resistant access at a favourable price-performance ratio. The basic concept of wristband identification is extremely simple individuals receive at the ticket counter for festivals, concerts or a public pool a wristband that either contains all important personal data printed in the form of a barcode or simply a running number, etc. printed on it. The wristband cannot be opened without damaging it, making it ideal for use instead of tickets at events. They are available in various versions for different applications, in different colours and some even with a waterproof adhesive at the closure. This way you combine high functionality with an attractive look, which optimally fits into the area of implementation. For usage in the healthcare sector Zebra offers durable and anti-microbial coated wristbands in various sizes - for newborns, children and adults. During registration at hospitals the most important patient information is encoded into a barcode and then custom-printed onto the wristband. If necessary, additional information such as name, station and blood type are printed onto the label as text to increase the safety of patients, guaranteeing clear allocations throughout the hospital. The automatic identification assumes several important functions first, it allows secure and efficient documentation of all treatment steps, which makes it an essential element for implementation of legal and internal guidelines. Furthermore, reliable identification of the right patient significantly increases success rates for operations, treatment, as well as diet and therapy plans. 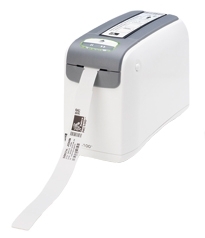 The compact HC100 wristband printer from Zebra is easy to use. The only consumables necessary are the wristbands, as the system uses thermal direct printing - ink ribbons or similar are not required. The printer automatically recognizes the type of wristband, so no adjustments are necessary. Software programmes use standard interfaces. The required drivers are available for different platforms. Using the direct thermal method, the HC100 prints all barcodes, text and even complex pictures at a resolution of 12 dots/mm 300 dpi and a maximum printing speed of 102 mm per second 51 mm/sec. in the healthcare sector, quickly and in pin sharp quality. High durability guarantees perfect readouts even after days. Abrasion, water, disinfection and cleaning agents that are common in hospitals do not harm the imprint. Maximum width for the wristbands is 30 mm at a maximum printing length of 558 mm and a minimum of 76 mm. In other words, a wristband offers sufficient space for guaranteed identification beyond any doubt. The design of the HC100 provides easy-to-use features that require minimal, if any, user interaction. There is minimal training required to use the HC100 or to load or switch the cartridge - its a quick and simple task. Like all other printing solutions from Zebra, the HC100 integrates into existing systems flexibly and easily. A plus that is especially important in highly complex hospital environments. The printer is equipped with a standard USB and serial interface. The printer is also available with the optional internal ZebraNet 10/100 print server or the internal ZebraNet wireless server. The robust and impact-resistant housing, which is typical for Zebra products, make the HC100 extremely durable, impressively compact and lightweight with less than 1.4 kg. The HC100 supports Unicode for multi-language printing and all commercial linear barcodes, as well as 2D barcodes. The HC100 is also equipped with an odometer for measuring the printing length and a tear-off mechanism.